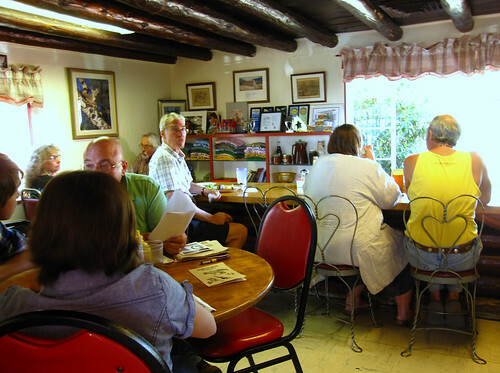 The Shed restaurant, near the Plaza in Santa Fe, is a local institution in a 300 year-old adobe. It's always exciting to travel somewhere that's still within the U.S. and has a really distinct food culture. I was surprised to discover how many local specialties were on the menus in Rhode Island and Hawaii; and everyone knows how amazing the food is in Louisiana. Portland, on the other hand, has great food, but few really distinct dishes. 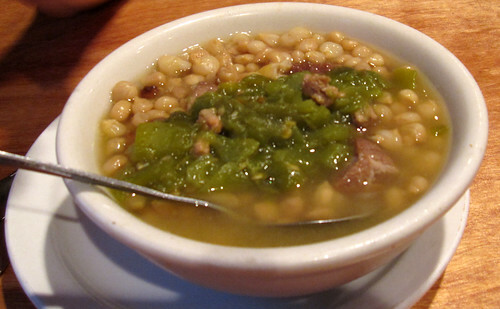 New Mexico is another place with dishes that you aren't likely to find in L.A., combining Native American and Mexican traditions with local products like green and red Hatch chiles, blue corn and lamb. Food bloggers FoodGPS, Estar*LA, GourmetPigs, Mattatouille and EatingLA were invited to Santa Fe over the weekend to attend the revived Taste of Santa Fe event and gala dinner to benefit the New Mexico History Museum, where Rivera's John Sedlar was the guest of honor. Sedlar (above, making tortillas at the Taste of Santa Fe gala), was possibly the first chef to bring the now-familiar Southwest flavors out of his native Santa Fe when he was cooking at St. Estephe in Manhattan Beach. He wrote the book Modern Southwest Flavors in 1986, but though we all started eating blue corn tortilla chips and chile-spiced chocolate truffles, it's hard to really understand the underpinnings of the region's cooking unless you travel to the area. 1) As John pointed out in an email before the trip, "Eat sopapillas whenever you can." 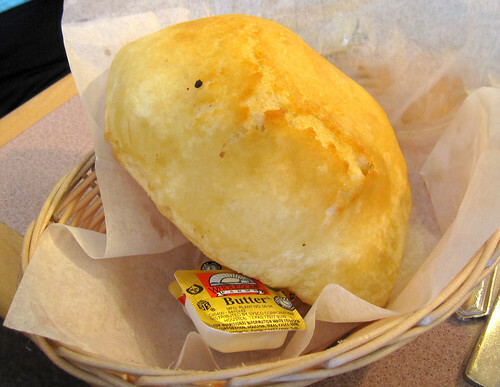 So we ate these pillowy raised puffs -- kind of a cross between a puffy pita bread and a super fresh flour tortilla -- at breakfast with honey and butter at restaurants like the Pantry and at dinner stuffed with chile adovada and lamb. 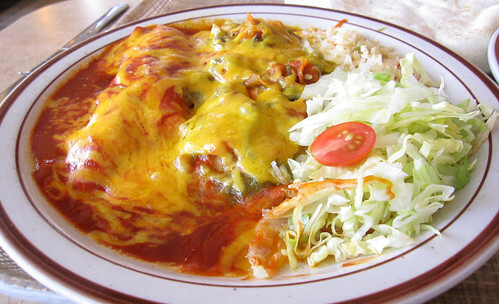 2) At nearly every meal, you'll be asked to choose between fresh green chiles, green chile sauce, or red chile sauce. If you're feeling indecisive, just say "Christmas" for a taste of both, like at Frontier Restaurant in Albuquerque, above. But some restaurants are better at one or the other, and some dishes work better with the somewhat more subtle and tangy green chiles than the smoky, assertively spicy red ones. 3) Seek out the area's hard-to-find dishes. Armed with a tip for lamb chicharrones at Angelina's in Espanola, north of Santa Fe from a Jewish mariachi trumpet player I met in the plaza, and a blessing from John and his mom, we drove through the thunderstorms to find a large coffeeshop-style diner full of local families eating chicos, or dried corn stew with pork and green chile; lamb ribs roasted to a bacony crispness, nuggets of chewy, flavorful lamb chicharrones, sopapillas stuffed with chile adovada, and plain sopapillas, of course. 4) Do not, repeat, do not, consider skipping breakfast. 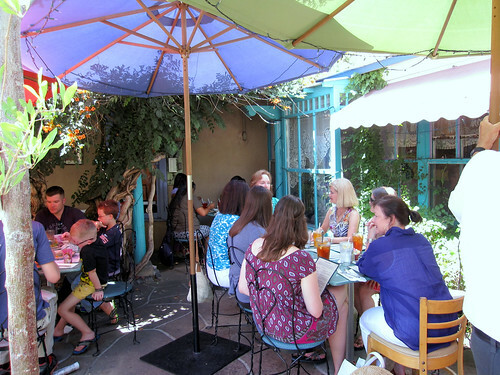 It seems to be the most beloved meal in Santa Fe, where it's a tough choice between pricey but creative modern Southwest dishes at Cafe Pasqual's, the sunny patio and blue corn pinon french toast at Cafe Guadelupe, and old favorites like the Plaza Cafe, Tia Sophia and Tecolote Cafe. 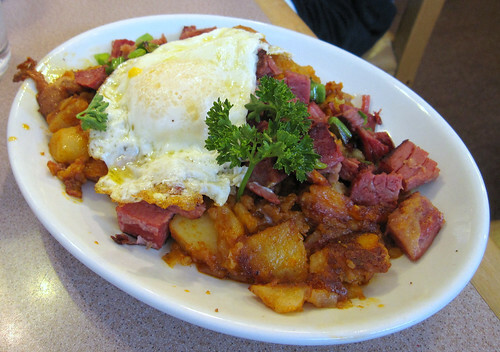 I would advise starting with The Pantry, a 60 year old diner on the outskirts of town with good prices and enormous portions of buckwheat pancakes, biscuits and gravy, red and green chile on a variety of egg dishes, corned beef hash (above), and solid sopapillas. 5) Be sure to try a green chile cheeseburger, preferably at Bobcat Bite, a low-ceilinged, atmospheric roadhouse on old Route 66. They're well worth the drive and $8 price, and you might even still spot a bobcat out back. 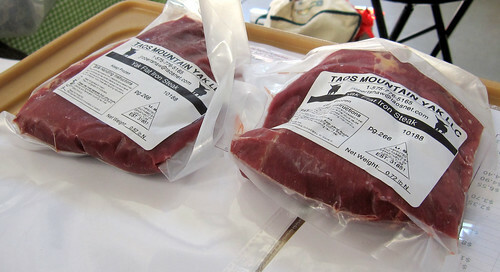 6) Check out local products at a farmers market. Santa Fe has a great, partially indoor market with tons of local color. Even if you can't take home some frozen yak sausage, there's great chile powders and adovada mixes, sage bouquets, baked goods for snacking, local goat cheese and some cute "vintage" table linen reproductions. Thanks ever so much to our hosts the Taste of Santa Fe, the very comfortable and well-located Inn at Loretto, the Shed and the Pantry. See more photos from Santa Fe, Espanola and Albuquerque on Flickr. Thanks for the great guide! I'm going to Santa Fe this fall for a conference and now have my to-eat list ready. Great recap. I'm always impressed how you're able to distill a weekend's worth of experiences into the most essential information.